Hair transplant surgery has evolved in the last 10 years thanks to microscopic techniques and research which elucidated the mechanism of hair loss and hair restoration surgery. We now can transplant with maximum natural results. We also increased the number of grafts which could be safely removed and harvested during a single hair transplant procedure. Mega session hair transplants have been a very hot topic and an interesting idea for many people who have a large balding area that cannot simply be covered with anything less than 3000-4000 grafts. At the offices of US Hair Restoration, we evaluate every patient for the quality of donor hair and scalp which will determine the number of grafts that could be safely harvested and transplanted in one surgery. Many people who are getting their first surgery can have over 3000 grafts. We have numbers of up to 5000 grafts, too. 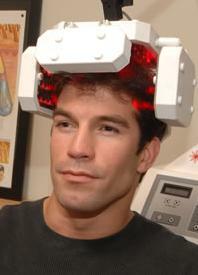 Laser hair restoration is a pretty new concept and unfortunately we still do not have enough solid research published in peer reviewed journals documenting its effectiveness. There have been some results in smaller studies with some effect. However, I would rather wait on that until we have more research-proven documents in that regard. You need to be evaluated for your donor potential and can consider surgery after that. US Hair Restoration has special hair transplant travel reimbursements for patients like you who have to fly from other cities. We also provide hotel and transportation to and from the hotel for anyone who has to commute more than 50 miles to get to our hair restoration center.